The OECD Observatory of Public Sector Innovation (OPSI) convened innovators from around the world for a conference on Innovation in Government: The New Normal on 20-21 November 2017. The conference highlighted insights from OPSI’s work with countries that are transforming their operations and improving the lives of their people through innovation. It brought together government leaders, public servants, and innovative partners in industry and civil society to connect, share experiences, and collaborate. Transforming government: Rebuilding the systems, cultures, and technology approaches for a 21st century government. Innovation methods & tools: Investigating frameworks, skills, and methods to unlock creativity and innovation, and embed them in the day-to-day work of public servants. Re-imagining boundaries: Re-imagining the role of government and moving beyond the four walls of the bureaucracy. Innovation for development: Innovating for sustainable development across the globe (mini-track). 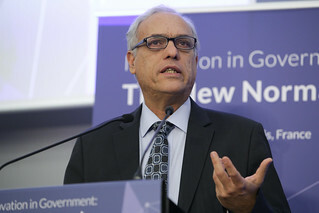 The event was organised by the OECD Observatory of Public Sector Innovation (OPSI) in cooperation with the European Commission’s Directorate-General for Research and Innovation. OPSI is an initiative of the OECD Directorate for Public Governance. Participation was open to government representatives, as well as experts from think tanks, agencies, civil society organisations, and other NGOs and academia interested in public sector innovation and achieving new possibilities.